Daily Illuminator: Excavate Munchkin Hidden Treasures Today! April 10, 2016: Excavate Munchkin Hidden Treasures Today! Love collecting rare cards but sometimes too tired to go search for them yourself? We did the hunting for you! In the Munchkin Hidden Treasures expansion, we gathered some of our rarer and out-of-print cards from different Warehouse 23 promo packs and put them all in one place. This set comes with 78 hard-to-find gems to uncover, for the most daring of explorers. 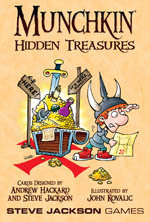 It may belong in a museum, but Munchkin Hidden Treasures is available exclusively through Calendars.com and Go! Toys and Games retail store.